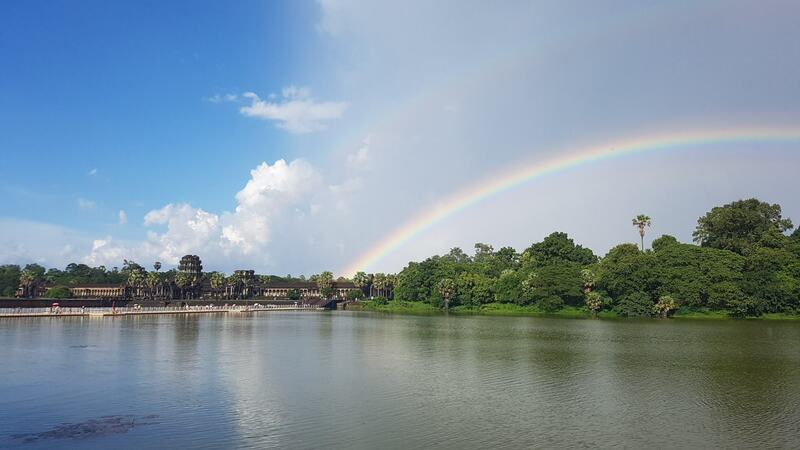 This is the the Angkor Wat Temple, just one of the many temples in Angkor by Siem Reap. And yes, you do see a rainbow that came out just after a short but heavy rainfall, as if it was thanking us for the waiting time! 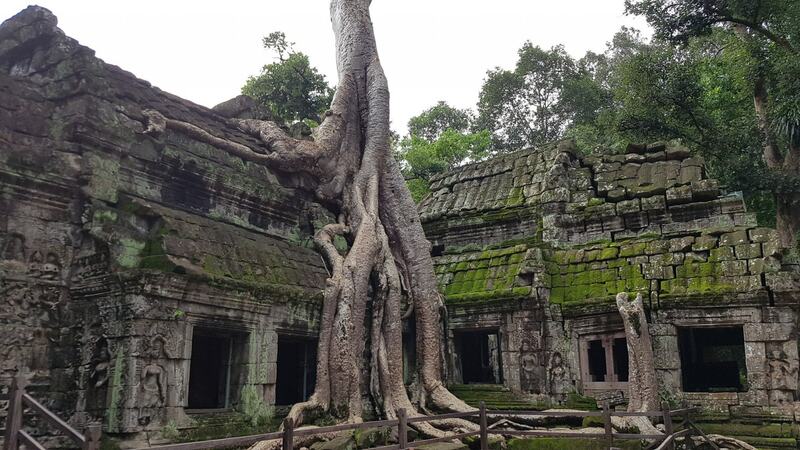 Ta Prohm is a Temple that has been only partially restored, it has been deforested and secured, but otherwise it looks pretty much like it did when it was found, with trees growing all over and around the temple, almost supporting it. 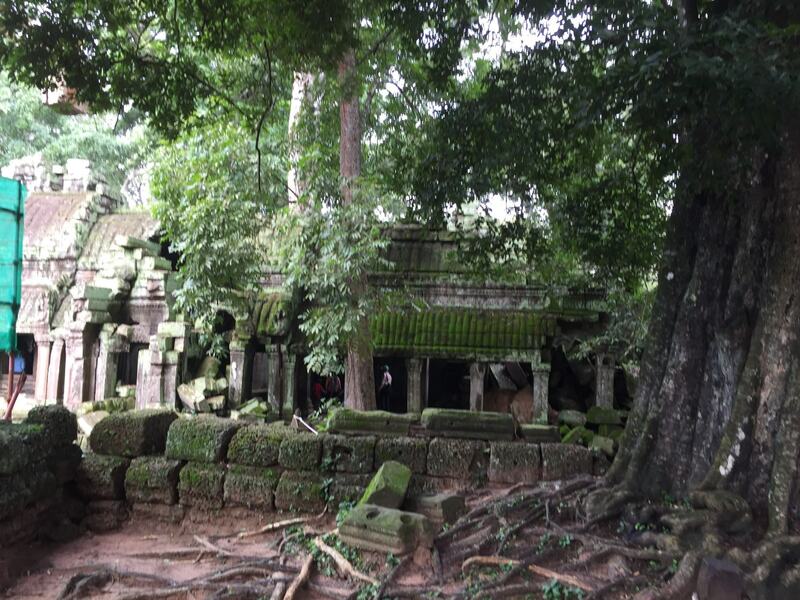 The tourists, as well as the locals, often call it the Tomb Raider Temple as this is where the movie has taken place. 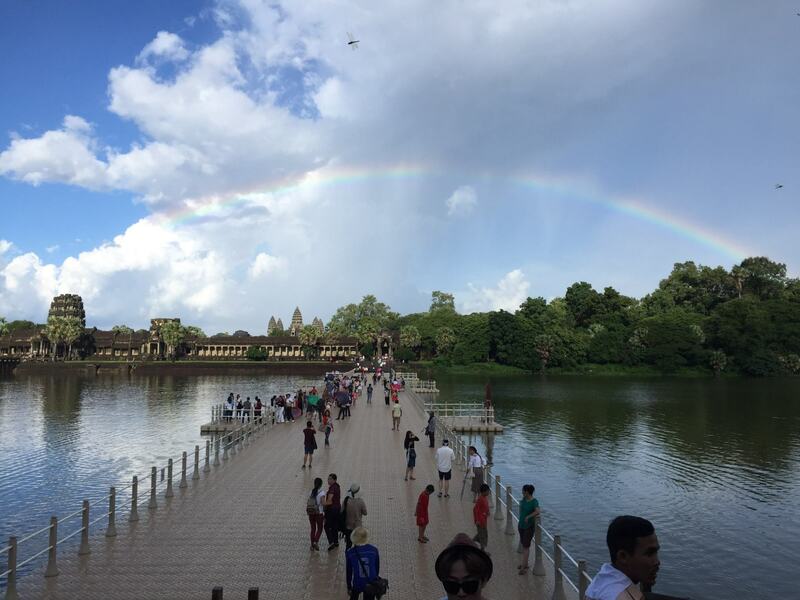 So, let me tell you more about this incredible adventure in Siem Reap, Cambodia! 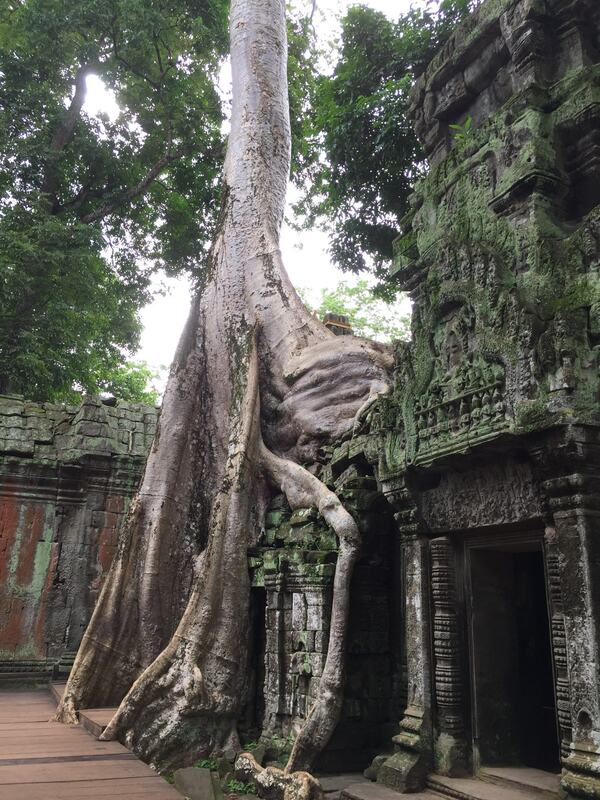 I spent three nights and four days in Siem Reap in September 2017 with my family, as we really wanted to see this amazing temples (it is said, that there are more then 1.000 temples – many of them are unfortunately just ruins, but believe me, there are enough standing and taken care of to keep you busy for days!!). 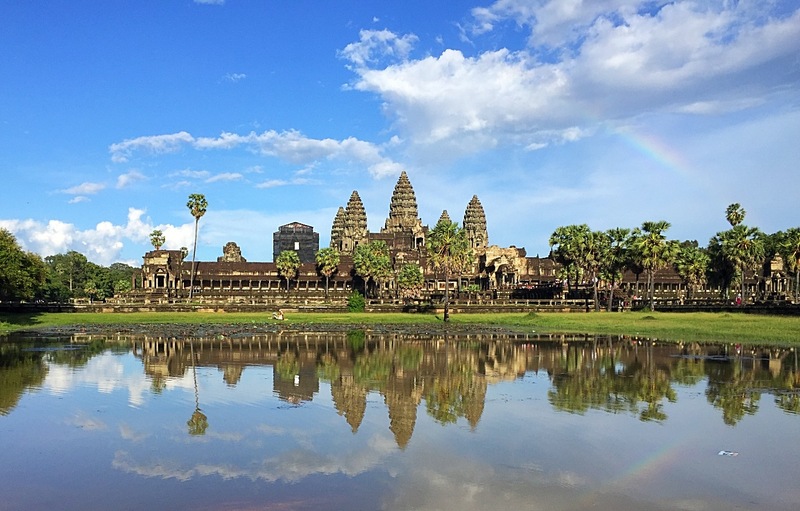 Traveling with two children, we decided to take it very easy and keep them happy by visiting the temples in the early morning and late afternoon to avoid the heat and to give them a break and some fun at the hotel pool in between. 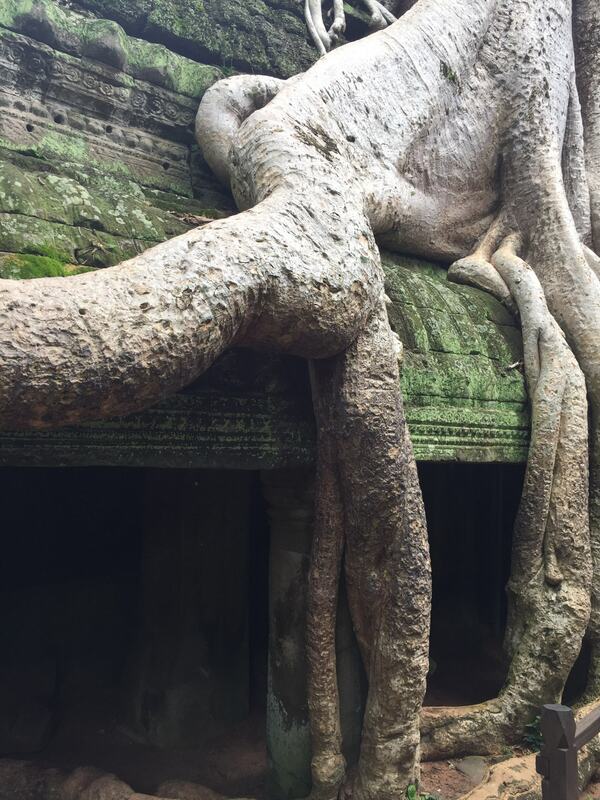 I was a bit anxious and didn’t know what to expect in Cambodia.. But I loved this experience, the lovely smiling people and of course the yummy food! There are lots of hotels to choose from, we booked the Le Meridien and had a wonderful time there – the rooms are big and very well maintained. The staff is friendly and very helpful. The pool was great for the kids and they also appreciated breakfast and snacks at the lobby. On the first night we took a Tuctuc (which is a motorbike with a kind of small carriage more or less attached to it) to the city center, where we dined at the Hard Rock Cafe, got all the must-have souvenirs and already started enjoying how child friendly the Cambodian are – we ate and the lovely waitresses and bartenders were entertaining our kids (back then 8 and 1,5 years old). The Tuctuc driver took us then for a tour thru the night market – very interesting, but too much hassle with the kids, so we were happy not to have to walk around. 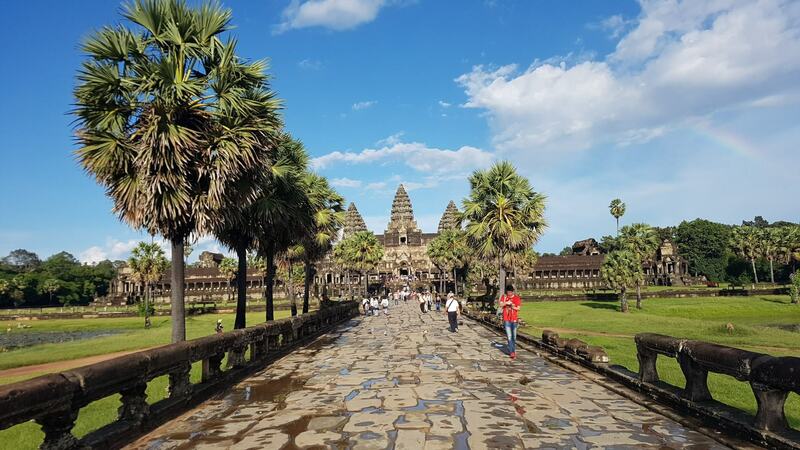 We arranged a car with a driver and an english speaking guide thru the hotel for the next two days – this made everything very easy and stress free! We would leave around 8:30 am visit 2-3 temples and come back to the hotel for a swim, lunch and rest. Then around 3:30 pm out again to check more temples. 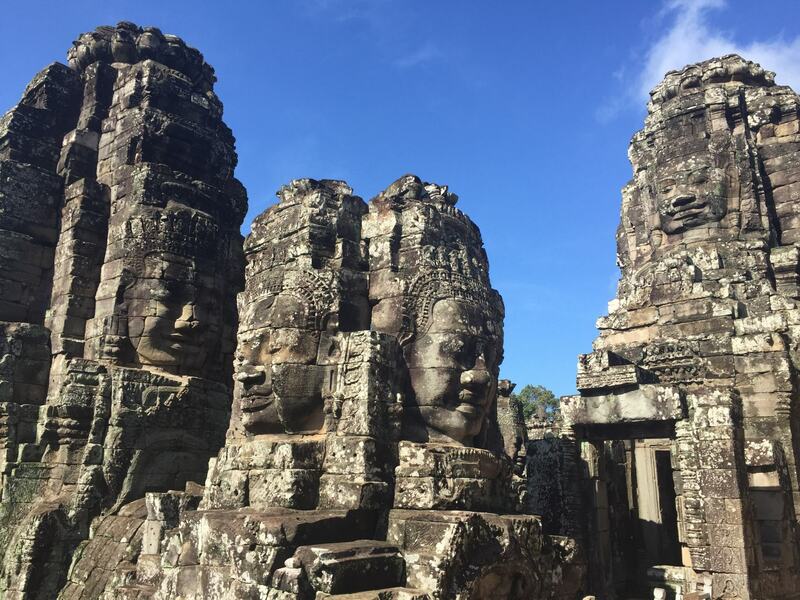 It is the Bayon Temple, its main feature are the 4 stone faces that decorate the many towers and the beautiful bas-relief on the outer wall (no decent picture as the temple is very popular and therefore packed with people..). Right at the first temple we understood the beauty of this place and the incredible work lots of international organization are putting in restoring amazing but long forgotten temples that almost disappeared in the jungle. 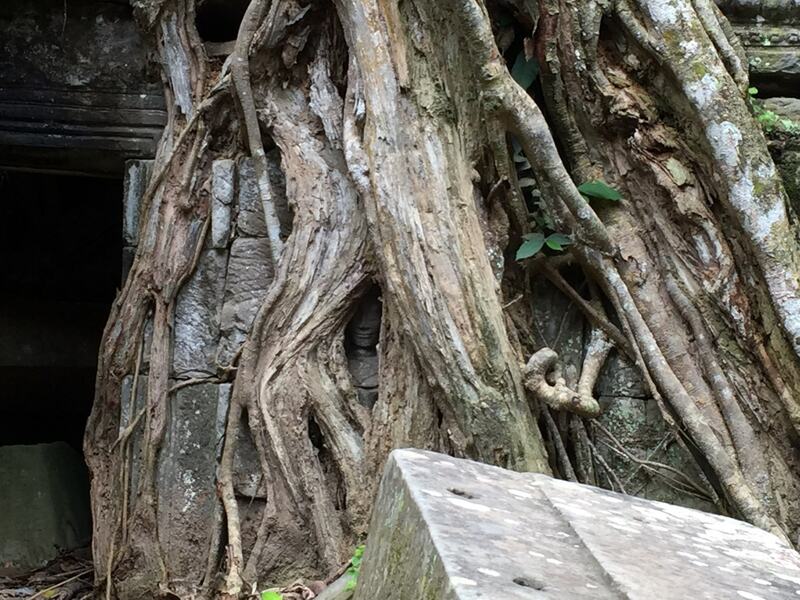 The fact that you can literally climb on and around the temples seemed fun at first, but we have seen way too many inconsiderate tourists putting in danger this place and themselves.. 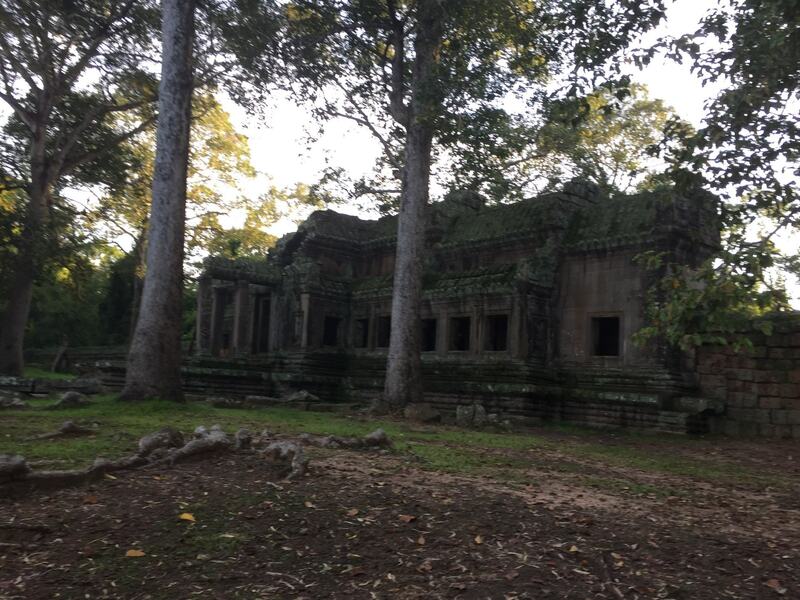 The Cambodian are thankful for the visitors and too polite to ask them to step back, so I hope the tourists will understand the fragility of this sacred places and will respect and honor them..
Let me just show you some impressive pictures which will have you book your ticket to Cambodia straight away! 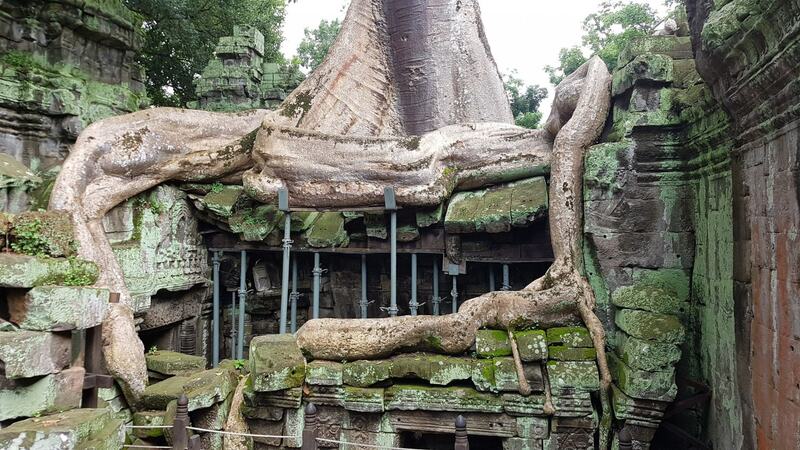 This huge tree is basically sitting on the Temple, it does give you an idea for how long it has been hidden in the jungle.. 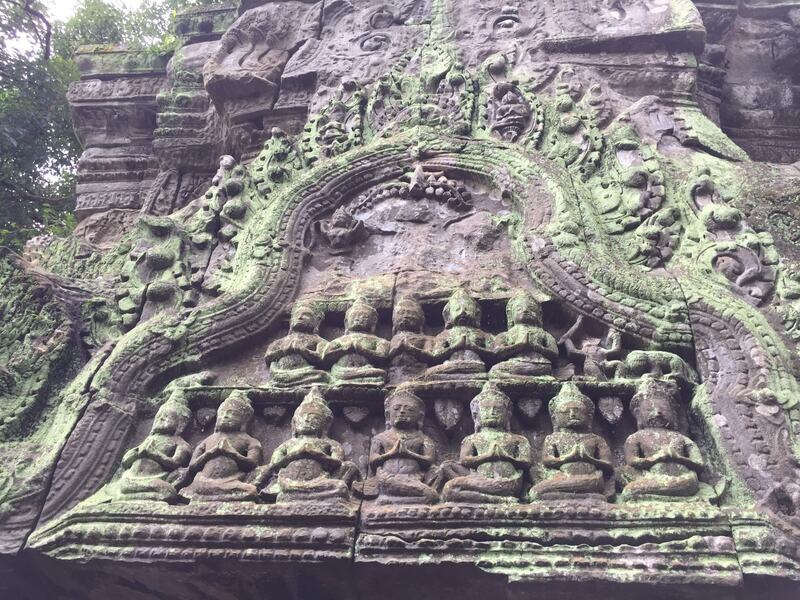 Even if the temples have been more or less abandoned for a very long time, you can still imagine and see the beauty of their decorations and the incredible effort made to create them! 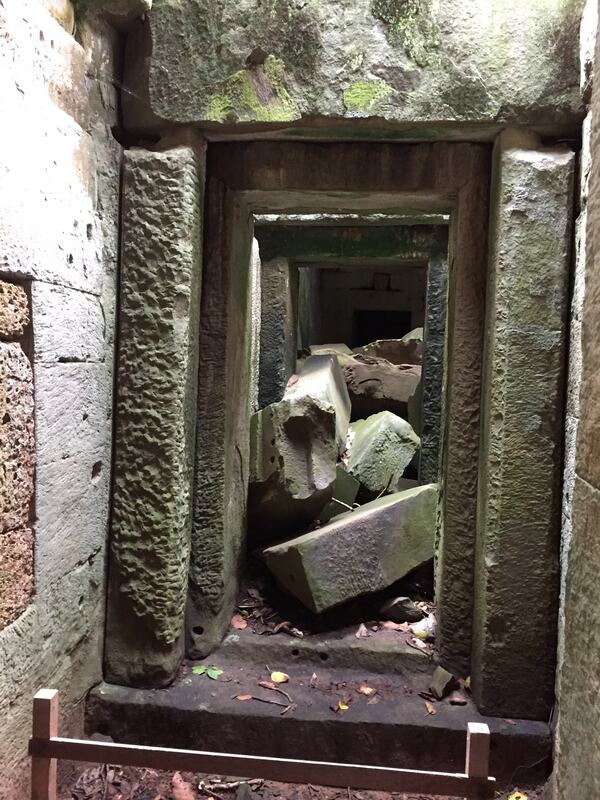 Let me bring you back to the centerpiece of this whole huge archeological site showing you above the entrance to Angkor Wat. I hope I have tickled your curiosity enough without boring you out (there is much more to say and show, believe me!!) 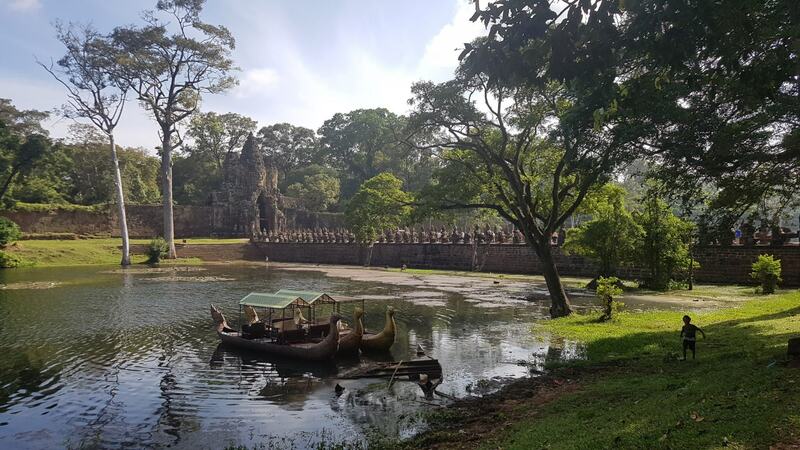 with a couple of impressions from Angkor Wat (Siem Reap) Cambodia. 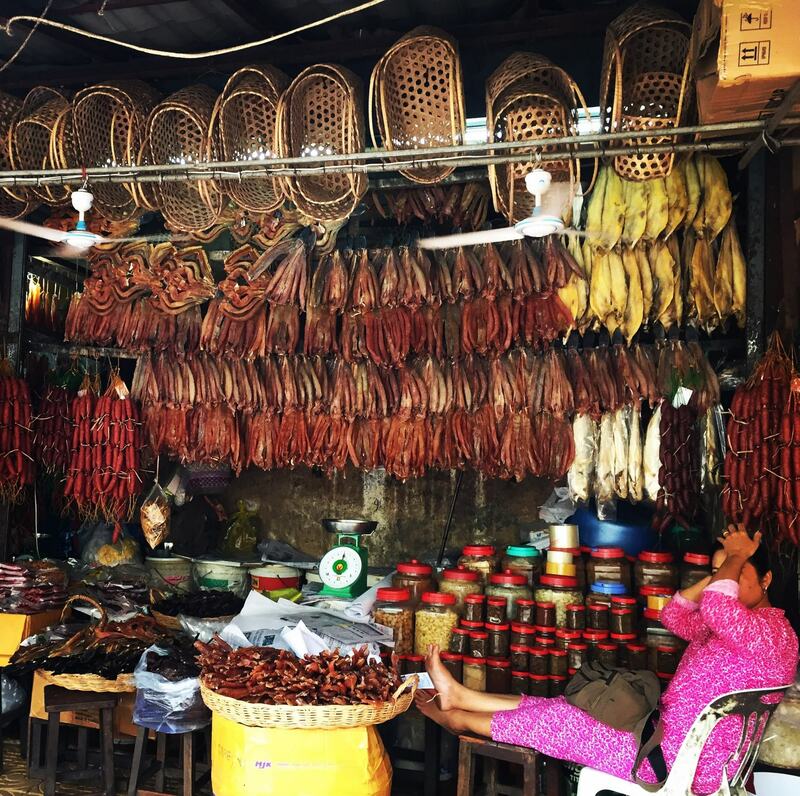 Shouldn’t that be enough, how about exploring the market for spices and sampling the tasty but mild cambodian cuisine? 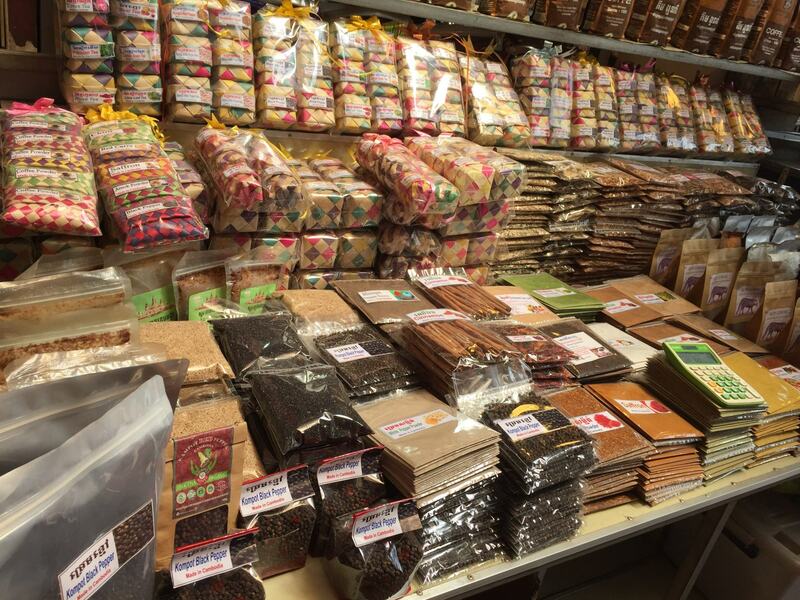 Dried meats, baskets, preserved vegetables, dried fish above. Spices, spice mixes, compote black pepper (cambodian), red pepper, below. 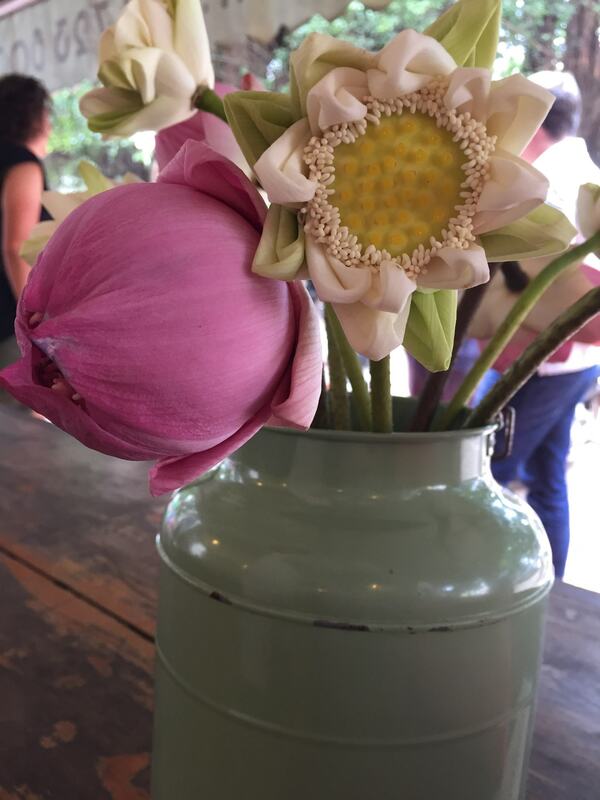 The cambodian cuisine is close to the Thai one, but it isn’t as spicy and has some french influences to it. 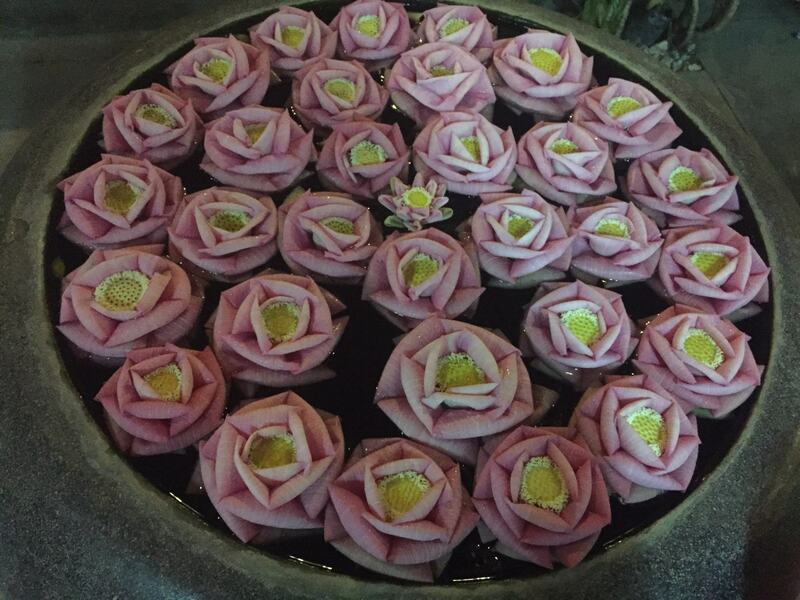 Click through the gallery below to see some of the dishes that Cambodia has to offer! 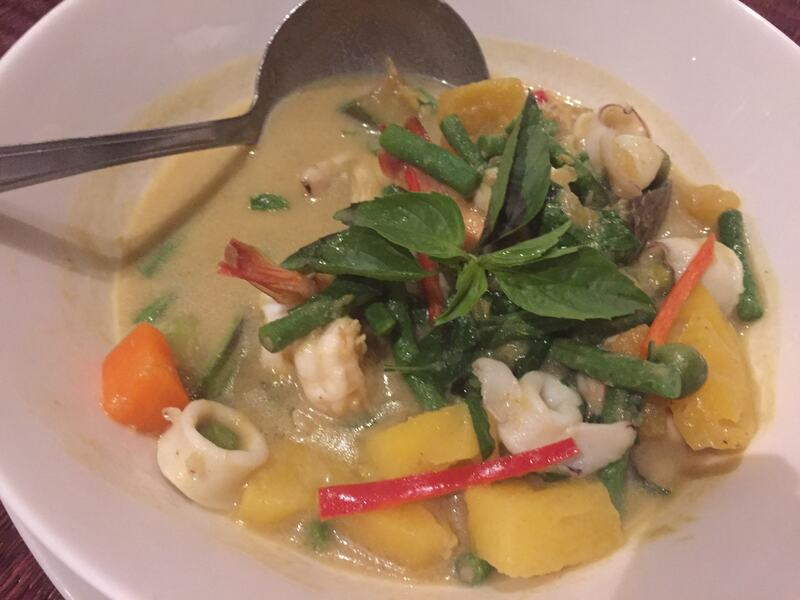 We tried a traditional dish called A Mok – a kind of mild green curry made of lemongrass, garlic, galangal (ginger), kaffir leaves and coconut milk with squids, fish, prawns, pineapple, french beans, carrots and local mini round aubergines. It was mild and delicious! 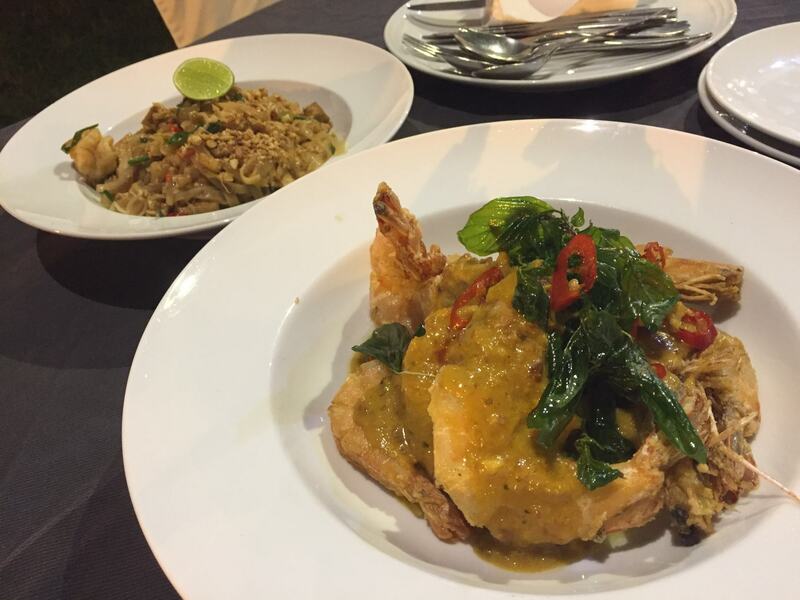 We also had deep fried prawns in a spicy curry coconut sauce, accompanied by spicy rice noddles wok fried with vegetables. The best coconut ice cream ever! 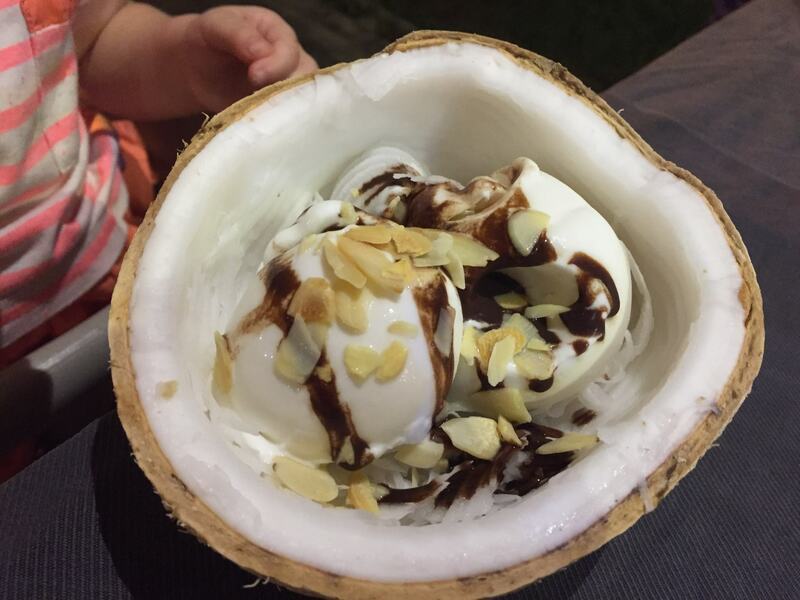 Served in half a coconut and topped with chocolate sauce and sliced toasted almonds! A funky cafe close to the night market was packed with cool people and serving organic and healthy meals, we had a refreshing pineapple juice (with a bambus straw!!) 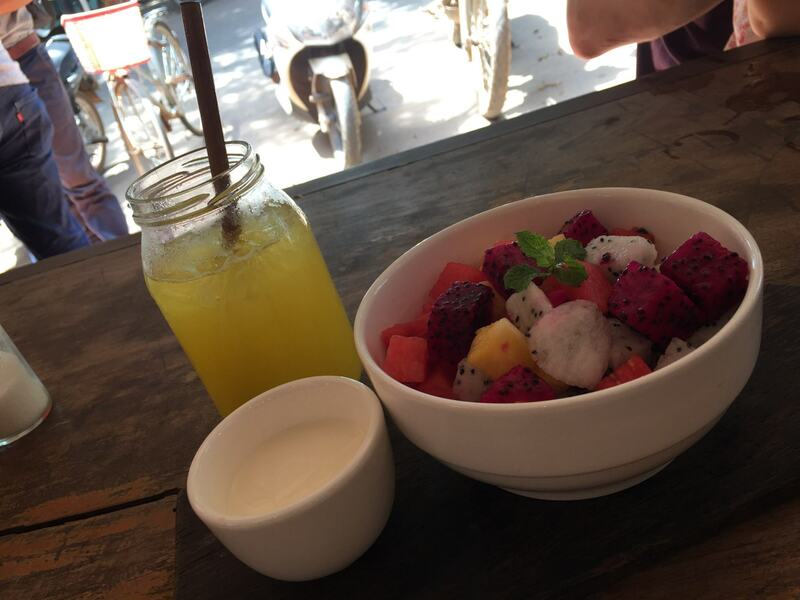 and fresh fruits with yogurt dip – perfect to beat the heat and believe me, you don’t get to taste juicy and naturally sweet fruits like those often!! 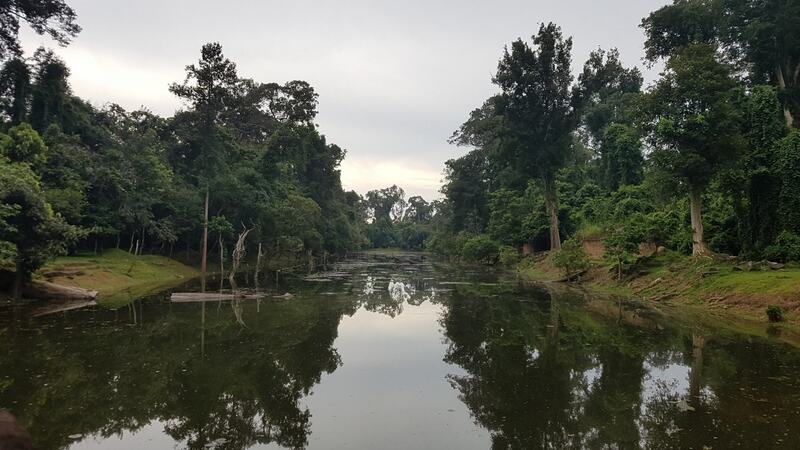 Nature definitely plays a huge role in Cambodia and offers you not only amazing ingredients, food, flowers but also stunning surroundings and views. We have only seen a very small part of this country, maybe you are lucky enough to explore more, as it also has beautiful beaches, lakes and landscapes.